Well, this is a shame. 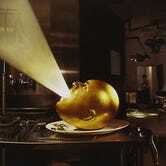 The Mars Volta, a band I have always had a great deal of respect for, is officially no more. I have to say, the only Volta album I ever really loved was their early full-length, De-Loused in the Comatorium. But what an album it was, MadLibs lyrics, self-indulgent ambient interludes and all. You can check out the standout track "Roulette Dares (The Haunt Of)" up top being played in Audiosurf by Bazaam86. I've always loved Jon Theodore's methodically, mathematically shifting drumming at 2:20. Anyone out there a fan of these guys? Sad (or happy) to see them go, interested in their new projects? Feel free to discuss bands, music, or whatever else, here or over in the Talk Amongst Yourselves forum.